Never feel boring by us. Choose from one of amazing activities and enjoy every minute of your vacation in Levin's Kosher Derby Hotel Davos. Let your kids enjoy our amazing Kids Club while you go and enjoy the beautiful Mountain Walks in Davos. Experienced teachers will watch your kids while you are shopping or going out for the day. On the Davos Promenade you will find all major shops, banks and boutiques such as: Bally, Calida, Benetton, Casino, Bucherer and many others. VIP pickup service at the Airport is possible with pre arrangement at the Reservation desk. Hotel Derby team is looking forward to welcome you and wants to make sure on your arrival to greet you personaly. In case of getting to Davos after 5:30pm, Please inform the front Desk. To find your way around in Switzerland by car is extremely easy! All roadways and highways are clearly signposted with the directions to your destination. - On your arrival at "Davos-Dorf" you can walk 3 minutes on the Promenade, past the Arabella Sheraton until you reach the Derby Hotel on your right side. Your Holiday starts already at the Airport! - On arrival in Zürich your bagage goes direct from the plane to the train leading to Davos-Dorf by itself. Please note: your Suitcase will arrive at Davos-Dorf Trainstation only 8 working Hours after landing in Zürich so if you land after 12:00 lunchtime you will get your suitcase only next morning. One of the most modern congress centres in the Alps. Ideal for meetings, congresses and events. Parsenn funicular railway to 12 km-long Parsenn descent - the oldest ski race in Switzerland. Station on the Landquart-Davos railway line. An hourly service towards Landquart. 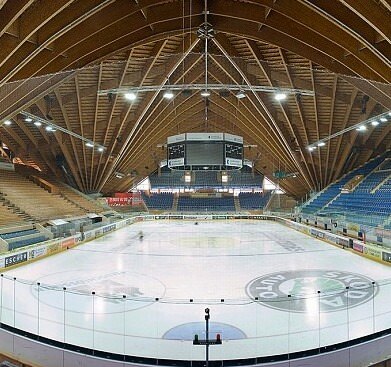 Beautiful ice sport arena with a stunning wooden roof design. Please check out our small collection of important links in order to make your Holiday as easy as possible. We recommend it because its just very swiss. Davos Klosters Inside. Tariffs & Tickets.